James W. ‘Sonny’ Choate, 76, passed away at his home on August 28, 2018 in Granbury, Texas with his wife, Norma Jean (Rogers) Choate, daughter Mary Ellen (Choate) Finnimore, son John Christopher ‘Chris’ Choate and grandson Nolan Choate at his side. Jim was born to Herman and Lois (Hill) Choate in Graham, Texas June 27, 1942. Jim graduated from Graham High School in 1960 and Texas Tech University in 1965. Jim and Norma Jean ‘Jean’ Rogers were married in Brownfield, Texas in 1964. Jim was commissioned as a second lieutenant in the United States Air Force in 1964 where he served our country in Vietnam and was awarded the Distinguished Flying Cross for his service. He continued to serve in the U.S. Air Force in various places in the United States. 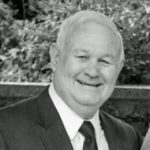 After his retirement from the military with 20 years of service in 1985, Jim received his Masters of Accounting from Texas Tech University and was licensed as a Certified Public Accountant. He then headed the Small Business Development Center at Tarleton State University in Stephenville, Texas. Albert James ‘A.J.’ Finnimore, Austin Choate, Nolan Choate, his brother Larry Choate, wife Norma, his sister Shirley Stice, husband Lawrence. He is preceded in death by his parents Herman and Lois Choate and his two brothers Billy Choate and Donny Choate. Special thanks to his dear friends Richard and Janis Petronis and his dear cousins E.W. and Gloria Cecil and Linda Cecil. Interment will be at Dallas-Fort Worth National Cemetery in Dallas, Texas on Tuesday, Sept. 4 at 10:30. The celebration and honoring of his life will be with family and friends at his home. In lieu of flowers, memorials may be made to the Jim Choate Memorial Scholarship, Stephenville Rotary Club, and P.O. Box 1252, Stephenville TX 76401. Praying for God's comfort in the days ahead.